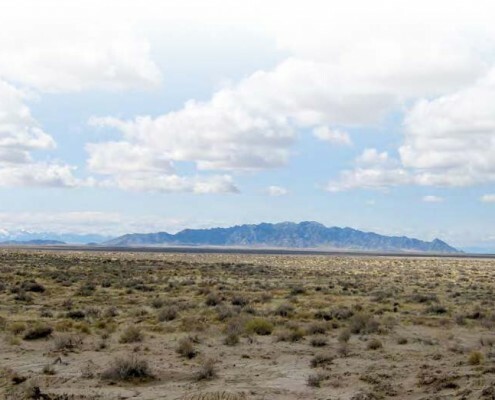 View to the west of Granite Peak Mountain and Sapphire Mountain (lower ridge at left), rising like a great battleship from the surrounding flats of the Great Salt Lake Desert. Think of a remote island known to few people. Are you thinking of the South Pacific or some other exotic locale? We in Utah have such an island located just 100 miles southwest of Salt Lake City. 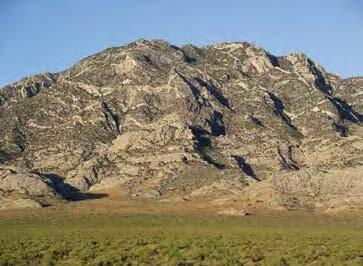 Informally named Granite Peak Mountain, this “island” is a little-known, uninhabited mountain that rises abruptly from the flats of the Great Salt Lake Desert south of Interstate 80. Because of its location on a high-security military base, few geologists have ever seen or studied the geology of Granite Peak Mountain. But last summer, a team of Utah Geological Survey (UGS) geologists was invited to produce a geologic map of the mountain. 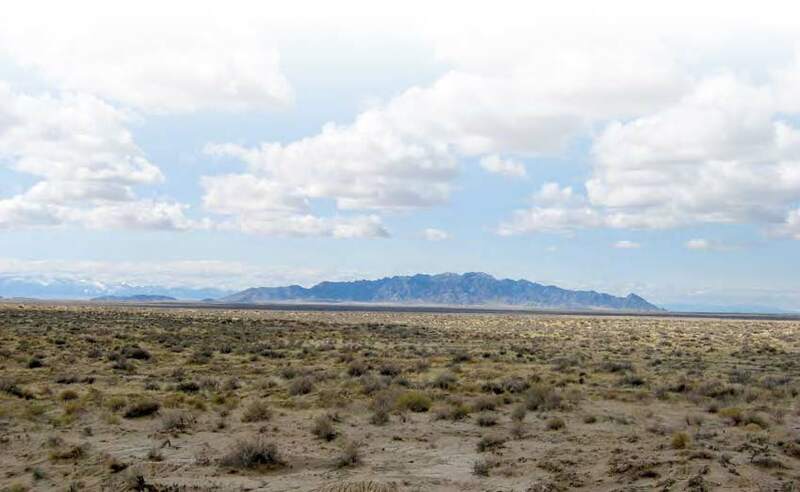 The UGS is collaborating in this effort with researchers from Brigham Young University (BYU), Weber State University, and the U.S. Geological Survey (USGS). When we started this project, many basic geologic questions about Granite Peak Mountain remained unanswered: (1) What are the rock types? (2) How old are these rocks? (3) What orogeny (mountain-building event) affected these rocks? (4) How did this mountain block become uplifted far above similar rock under the surrounding valley floor? In the late 1800s and early 1900s, Granite Peak Mountain was home to miners and bootleggers. Miners searched for precious metals (gold, silver), base metals (copper, lead, iron), and fluorite, mica, and beryl. In the early 1900s, a spring near the north end of the mountain was an important water stop on the Lincoln Highway, the nation’s first transcontinental highway (New York to California). The onset of World War II led to the creation of Dugway Proving Ground in 1942 by President Franklin D. Roosevelt. Since then, national security has kept Granite Peak Mountain shrouded in geologic secrecy. There has been little study of the mountain’s geology, except for a 1920 report on area mining districts, a 1964 BYU student thesis, and some USGS reconnaissance work. Most of Granite Peak Mountain is composed of two primary rock types—dark-colored layered granitic rock (foliated granodiorite) and light-colored granite (leucogranite). The upper part of the leucogranite appears to have been affected by high pressure and temperature, converting it to foliated granodiorite. The presence of these metamorphic and igneous rocks is interesting because such rocks are known from only a few areas in Utah. Magma was generated at great depth in the Earth and the Granite Peak pluton (igneous intrusion) was ultimately emplaced about 4 miles or less below the Earth’s surface. The overlying rocks have subsequently been eroded leaving the intrusion exposed. At the south end of Granite Peak Mountain, the granodiorite intrudes a small area of metamorphosed sedimentary rocks. These rocks include schist, marble, and quartzite, which were transformed by increased pressure and temperature from the original shale, limestone, and sandstone parent rocks, respectively. These metamorphic rocks provide an important clue to the mountain’s geologic history. A noteworthy and striking feature of Granite Peak Mountain is the presence of pegmatite dikes, the focus of the 1964 BYU study. A pegmatite is an unusually coarse-grained igneous rock, and a dike is an igneous intrusion that cuts across pre-existing rock. These pegmatite dikes are visible as bold white streaks that form intricate patterns (see cover photograph). The dikes cut across the granodiorite, leucogranite, and metasedimentary rocks, but are most obvious and voluminous within the granodiorite rock unit. Their emplacement may be related to a later phase of the leucogranite intrusion when the rare element beryllium was concentrated in the final liquids to crystallize. Rhyolite and andesite dikes also cut the various rocks of Granite Peak Mountain. The rhyolite dikes may be related to a rhyolitic lava flow that forms Sapphire Mountain, a low ridge just south of Granite Peak Mountain. These two types of dikes cut across all other rock types and are not metamorphosed, thus providing an indication of their relatively young age. Geologists have long wondered about the age of the granite and metamorphosed rocks that form Granite Peak Mountain. Prior estimates ranged widely from 1.6 billion years old (Precambrian) to 13 million years old (late Tertiary). We now have field relationships of the rocks, chemical comparisons, and sophisticated laboratory dating methods on minerals composing the rocks to help us answer the question of age. Preliminary work indicates that the metasedimentary rocks are likely the oldest exposed rocks. They are now tentatively considered to be roughly 540 to 245 million years old (Paleozoic), correlating to unmetamorphosed rock originally deposited in a shallow-marine environment and now exposed in mountain ranges to the west and south. The Paleozoic rocks of Granite Peak Mountain were subsequently intruded and metamorphosed by the leucogranite, granodiorite, and pegmatite approximately 150 million years ago (Late Jurassic). This age is comparable to other granitic intrusions in western Utah at Notch Peak of the House Range to the south, and at the Newfoundland Mountains, Silver Island Mountains, and northern Deep Creek Range in northwest Utah. The rhyolite and andesite dikes cutting these older rock units are not yet dated, but are likely 40 to 5 million years old (Tertiary. The preliminary results of our research have given us insight into the geologic context of Granite Peak Mountain. This mountain is one of several intrusions in western Utah, Nevada, and the Sierra Nevada mountains of California emplaced in Late Jurassic time. This regional mountain-building event may be attributed to the Nevadan orogeny from about 160 to 120 million years ago (Late Jurassic to Early Cretaceous), a precursor to the Sevier orogeny which significantly affected the western half of Utah from about 120 to 40 million years ago (Early Cretaceous to Eocene). The Jurassic igneous and metamorphic rocks were subsequently exposed through doming and/or extensional faulting. The extension or stretching of western Utah and the Great Basin began about 17 million years ago and continues today. Don Clark is a geologist with the UGS Mapping Program, primarily involved with 1:24,000- and regional-scale geologic mapping projects in northwest Utah. His specialty is geologic mapping and stratigraphic studies of sedimentary and volcanic rocks. He has mapped all or parts of nine 7.5-minute quadrangles in Juab, Utah, and Tooele Counties, and also manages several mapping projects by non-UGS geologists in northwest and southeast Utah. Don and Jack Oviatt of Kansas State University are currently mapping Dugway Proving Ground and adjacent areas (parts of the Wildcat Mountain, Rush Valley, and Fish Springs 30′ x 60′ quadrangles). Prior to joining the UGS in 2004, Don worked as a UGS student and contract mapper, and also as a Chicago-based environmental geologist.